A truly exceptional vineyard. Explosive aromatics and flavors, including blackberry, sarsaparilla and wood smoke. This is a profound cold climate Pinot Noir boasting a beautiful garnet color and incredible richness. The wine offers aromas of blackberry and black plum with accents of sarsaparilla, wood smoke and thyme. An explosion of flavors includes hints of black raspberry and ripe plum with a touch of ocean salinity and smokiness. The luxurious texture is richly layered, superbly balancing smooth tannins with a gentle thread of acidity, setting the stage for outstanding aging potential. 100% Radian Vineyard, Sta. Rita Hills. One of the appellation’s most picturesque and coldest vineyards, this estate is located in the southwest corner of Sta. Rita Hills, unsheltered from direct exposure to cold winds and marine fog from the Pacific Ocean. Planted in 2007, Radian has quickly become one of the superstars of the AVA. Soils are very rocky with clay loam and generous amounts of diatomaceous earth. The austere soils combined with persistent coastal winds result in small clusters and tiny berries, leading to deep, concentrated wines. Pinot Noir clones used in this wine include 115 and 667. The 2014 vintage made history as the earliest harvest on record in Santa Barbara County. It was also the shortest in duration, commencing on August 25 and concluding just 32 days later. The growing season began with a very mild winter and below average rainfall for the third year in a row. Budbreak occurred in early March followed by warm, even temperatures throughout the spring and summer. Yields were a touch above average in most vineyards, though slightly lower than 2013. 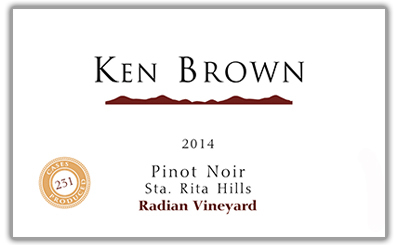 Pinot Noir grapes from Radian Vineyard were harvested on August 30 and September 9. Pinot Noir clusters for this wine were hand sorted before being de-stemmed and gravity fed to fermenters. The must was immediately chilled for a pre-fermentation cold soak where the most beneficial extraction of color, aroma and flavor occurs. Concentration was enhanced by gently punching down the cap several times per day. The wine aged 18 months in French oak barrels, longer than our other Pinot Noirs, allowing the extraordinary layers of complexity to be expressed. About 35% of the barrels were new French oak. The wine was bottled on March 25, 2016.